In years past, I didn't do anything for April Fools' Day. I was usually in survival mode during my children's early years. However, now that my kids are older, it is so much fun! No diapers, no naps (needed), they love exploring and traveling, and I have a couple pranksters! Hiding behind corners and trying to scare each other is a daily occurrence here. One of my boys received a prank kit last Christmas and it's been nonstop ever since. Shocking pens, whoopee cushions, fake injuries, itching powder, you name it! This year I decided to pull a few pranks of my own on them. First up, was their lunches. They had "moldy" bread, bugs, and olives disguised as chocolate covered almonds. They all despise olives so this was a great one. However, only one out of four was brave enough to investigate the olives. The others didn't even touch them. When they returned home from school, they were greeted with a surprise junk food dinner. Lemonade was served. However, as they quickly realized it wasn't really lemonade. Lemon jello looks an awful lot like lemonade when presented in a cup with lemons and a straw! One of their favorite junk foods, corn dogs were also served. Although, these aren't ordinary corn dogs, these are actually cake pops! I found this recipe on Hungry Happenings. Beth has an amazing blog filled with all kinds of fun food creations. My corn dogs didn't turn out as pretty as hers did, but the kids said they tasted great! You can't serve junk food without burgers! These were a hit with even my husband who was my official taste tester last night. I made vanilla cupcakes and cut them in half for the burger buns. Tinted vanilla frosting with red and yellow food coloring for the ketchup and mustard. 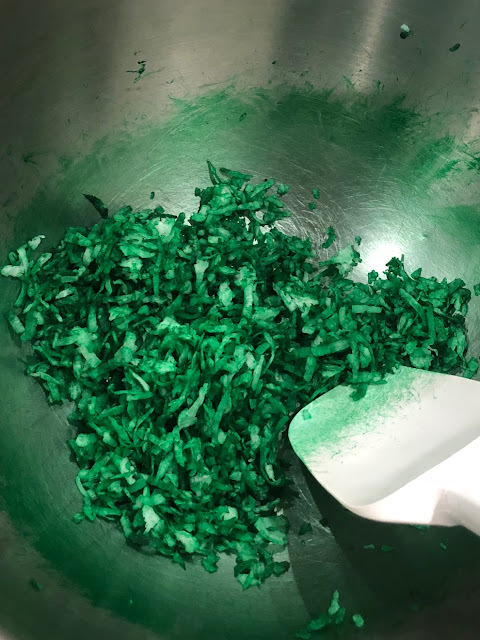 Dyed shredded coconut green for the lettuce. And then added a Keebler Grasshopper cookie for the meat and sesame seeds to top it all off. I hope you didn't get fooled today! And if you did, please share it. I would love to hear what your favorite pranks to pull are?